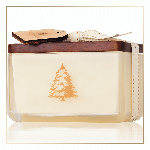 Thymes Frasier Fir Northwoods 2 Wick Candle is the classic seasonal fragrance that's perfect for holiday gift giving. Evoking the crisp freshness of Frasier Fir, this candle spreads joyful cheer with every gentle flicker. Contained in custom glass with a beautiful wooden lid, this 2-Wick Candle comes packaged ready for giving, topped with a ribbon and gift tag. With the aromatic snap of Siberian Fir needles, heartening cedarwood and earthy sandalwood, Thymes Frasier Fir evokes the warmth and comfort of the holiday season.